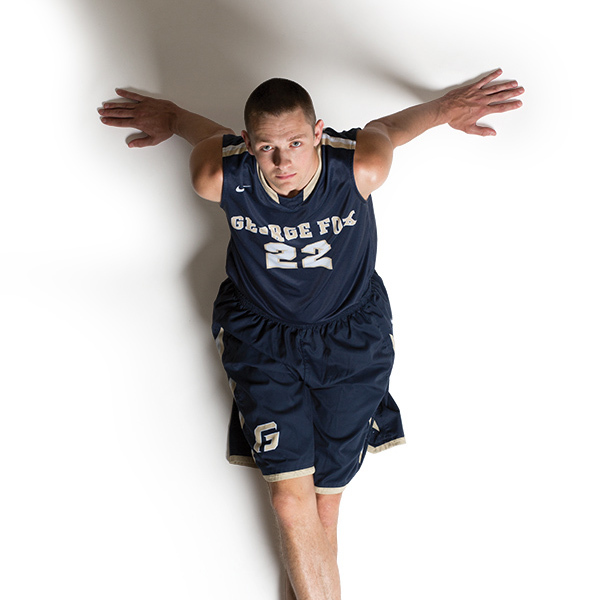 Four years ago, JJ Lacey came to George Fox as a lanky freshman, but he quickly grew into a pillar of the men’s basketball program. Over the course of his four-year career he played in 101 games and scored 1,149 points, good for 22nd all-time in the Bruin record book. Last season, his senior year, Lacey led his team to the Northwest Conference Tournament and was rewarded with a NWC first-team selection. In April, he graduated with a degree in marketing. The soft skills that propelled Lacey to excel on the basketball court also served him well in the classroom. “JJ is extremely dependable, a serious student, engaging in the classroom, teachable, open to constructive feedback and hardworking,” says business professor Dirk Barram. Lacey’s determination to succeed academically paid off, earning him dean’s list recognition four consecutive semesters to end his undergraduate career. But stats and accolades don’t tell the whole story. 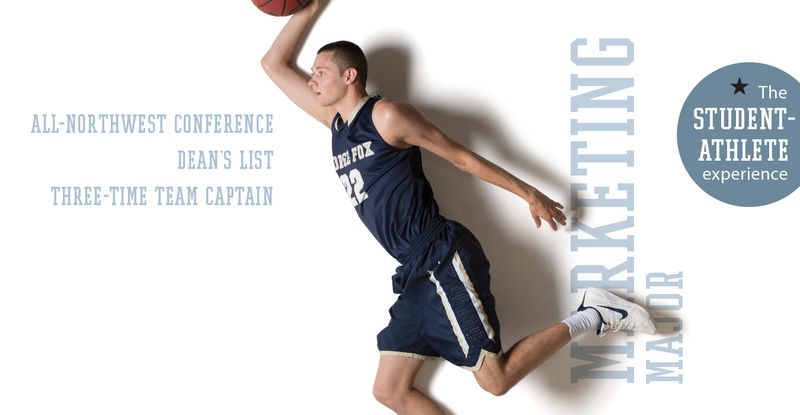 Head men’s basketball coach Maco Hamilton arrived at George Fox in 2013 – the same year as Lacey – and is quick to point to his star player’s growth as a person over the course of four years. Hamilton pushes, challenges and shapes his athletes from their first moments on campus. He teaches them to be “MBFOs” – “men built for others” – which flies in the face of the stereotypical tough, strong and emotionally isolated picture of manhood popular in today’s culture. Hamilton expects vulnerability from his players. He expects them to share emotion and live their lives not just for themselves. It was a jarring transition for Lacey, who entered college with the bravado he’d learned through high school, firmly believing men weren’t supposed to show emotion or weakness. The trouble was, Lacey is an emotional person, and sometimes he would break down – he just made sure to do it privately to avoid embarrassment. Hamilton’s mentorship and coaching changed his perspective. Lacey recalls his junior year when his great-grandma was coming to the end of her life in the middle of the basketball season. He drove out to visit her and say goodbye before heading back to Newberg that afternoon in time for the Bruins’ game against Pacific University. She passed away hours before tipoff, and with her loss still heavy on his heart he rallied his team to a double-overtime victory, scoring 19 points. Hamilton also challenged Lacey to flex his mentoring muscles by putting him in a team leadership role midway through his sophomore season – far earlier than is asked of most college athletes. Lacey didn’t always feel prepared to take that position, but Hamilton was certain he’d found the right person to lead the team and develop the right culture for the men’s basketball program. Now, as of April a college graduate, Lacey knows that those meaningful interactions and life-shaping experiences with his teammates will mean more to him in the long run than any statistic or athletic milestone. “I feel most proud of just knowing that I walked away doing everything that I could to make the program better, make my team better, make the school better,” he says.